When most people start implementing inbound marketing, they’re primarily worried about getting enough new leads in the funnel. But once you have a lot of leads, you need to figure out who’s really interested in your product and who’s just starting to look around. Lead scoring is the process of assigning values, often in the form of numerical “points,” to each lead you generate for the business. You can score your leads based on multiple attributes, including the professional information they’ve submitted to you and how they’ve engaged with your website and brand across the internet. This process helps sales and marketing teams prioritize leads, respond to them appropriately, and increase the rate at which those leads become customers. Learn more about the concept of lead scoring in the video below. Every company has a different model for assigning points to score their leads, but one of the most common ways is using data from past leads to create the value system. How? First, you’ll take a look at your contacts who became customers to see what they have in common. Next, you’ll look at the attributes of your contacts who didn’t become customers. Once you’ve looked at the historical data from both sides, you can decide which attributes should be weighted heavily based on how likely they are to indicate someone’s a good fit for your product. Lead scoring sounds easy, right? Depending on your business model and the leads in your database, this can quickly become complicated. To make this process a little easier on you, we’re going to walk you through the basics of creating a lead score, including what data you should look at, how to find the most important attributes, and the process for actually calculating a basic score. Lead scoring models ensure the values you assign to each lead reflect the actual compatibility they have with your product. Many lead scores are based on a point range of 0 to 100, but every lead scoring model you create will support a particular attribute of your core customer. Are you only selling to people of a certain demographic, like parents of young children or CIOs? Ask demographic questions in the forms on your landing pages, and you can use your leads’ answers to see how well they fit in with your target audience. One thing you can do with this information is remove outliers from your sales team’s queue by subtracting points for people who fall into a category you don’t sell to. For example, if you only sell to a certain geographic location, you might give a negative score to any lead who falls outside the proper city, state, zip code, country, and so on. If some of your form fields are optional (like a phone number, for instance), then you also might award extra points to leads who provide that option information anyway. If you’re a B2B organization, are you more interested in selling to organizations of a certain size, type, or industry? Are you more interested in B2B organizations or B2C organizations? You can ask questions like these on your landing page forms, too, so you can give points to leads who fit in with your target audience and take points away from leads who aren’t at all what you’re looking for. How a lead interacts with your website can tell you a lot about how interested they are in buying from you. Take a look at your leads who eventually become customers: Which offers did they download? How many offers did they download? Which pages — and how many pages — did they visit on your site before becoming a customer? Both the number and types of forms and pages are important. You might give higher lead scores to leads who visited high-value pages (like pricing pages) or filled out high-value forms (like a demo request). Similarly, you might give higher scores to leads who had 30 page views on your site, as opposed to three. What about leads who have changed their behavior over time? If a lead has stopped visiting your website or downloading your offers, they may not be interested anymore. You might take points away from leads who’ve stopped engaging with your website after a certain period of time. How long — 10 days, 30 days, 90 days — depends on your typical sales cycle. If someone’s opted in to receive emails from your company, you’re not sure how interested that person is in buying from you. Open and clickthrough rates, on the other hand, will give you a much better idea of their interest level. Your sales team will want to know who opened every email in your lead nurturing series, or who always clicked through your offer promotion emails. That way, they can focus on the ones who seem most engaged. You might also give a higher lead score to leads who click through on high-value emails, like demo offers. How engaged a lead is with your brand on social networks can also give you an idea of how interested they are. How many times did they click through on your company’s tweets and Facebook posts? How many times did they retweet or share those posts? If your target buyers are active on social networks, then you might consider awarding points to leads with certain Klout scores or numbers of followers. Last but not least, you might want to give negative scores to leads who filled out landing page forms in ways that could indicate they’re spam. For example, were first name, last name, and/or company name not capitalized? Did the lead complete any form fields by typing four or more letters in the traditional “QWERTY” keyword side-by-side? You might also want to think about which types of email addresses leads are using compared with the email addresses of your customer base. If you’re selling to businesses, for example, you might take points away from leads who use a Gmail or Yahoo! email address. How Do You Know What Matters Most? That’s a lot of data to weed through — how do you know which data matters most? Should you find out from your sales team? Should you interview your customers? 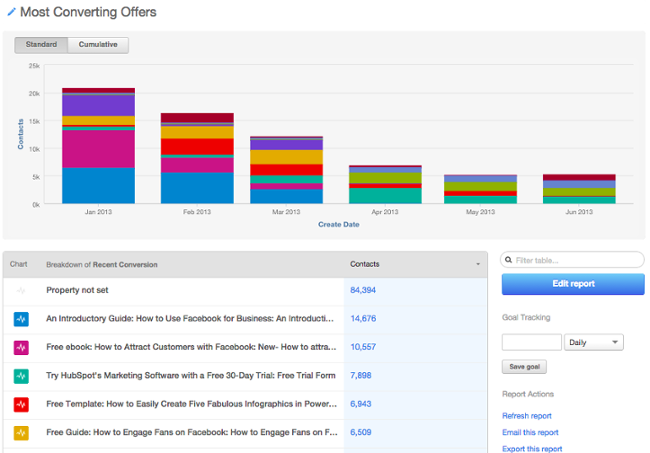 Should you dive into your analytics and run a few reports? Actually, we recommend a combination of all three. Your sales team, your customers, and your analytics reports will all help you piece together what content is most valuable for converting leads into customers, which will help you attach certain points to certain offers, emails, and so on. Sales reps are the ones on the ground, communicating directly with both leads who turned into customers and those who didn’t. They tend to have a pretty good idea of which pieces of marketing material helps encourage conversion. Which blog posts and offers do your sales reps like to send leads? You might find some of them telling you, “Every time I send people this certain piece of collateral, it’s easier to close them.” This is valuable information. Find out what those pieces of collateral are, and assign points accordingly. While your sales team might claim certain content converts customers, you might find that the people who actually went through the sales process have different opinions. That’s okay: You want to hear it from both sides. Conduct a few customer interviews to learn what they think was responsible for their decision to buy from you. Be sure you’re interviewing customers who had both short and long sales cycles so you get diverse perspectives. You should also complement all this in-person research with hard data from your marketing analytics. Is One Lead Score Enough? If you have one core customer right now, a single score suffices. But as your company scales, you’ll sell to new audiences. You might expand into new product lines, new regions, or new personas. You might even focus more on up-selling and cross-selling to existing customers, rather than pursuing new ones. If your contacts aren’t “one size fits all,” your scoring system shouldn’t be either. Let’s say, for instance, your sales team wants to evaluate customers on both fit (i.e. is a contact in the right region? The right industry? The right role?) and interest level (e.g. how engaged have they been with your online content?). If both of these attributes are a priority, you can create both an engagement score and a fit score, so that you can prioritize outreach to contacts whose values are high in both categories. Say you’re a software company that sells two different types of software, via different sales teams, to different types of buyers. You could create two different lead scores — one for a buyer’s fit and the other for their interest in each tool. The, you’d use these respective scores to route leads to the right sales teams. As you grow, you might start to focus on up-sell or cross-sell as much as new business. But keep in mind the signals that indicate quality of new prospects and existing customers often look completely different. For prospects, you might look at demographics and website engagement, whereas for existing customers, you might look at how many customer support tickets they’ve submitted, their engagement with an onboarding consultant, and how active they currently are with your products. If these buying signals look different for different types of sales, consider creating multiple lead scores. 1. Calculate the lead-to-customer conversion rate of all of your leads. Your lead-to-customer conversion rate is equal to the number of new customers you acquire, divided by the number of leads you generate. Use this conversion rate as your benchmark. 2. Pick and choose different attributes customers who you believe were higher quality leads. There’s a certain kind of art to choosing which attributes to include in your model. You’ll choose attributes based on those conversations you had with your sales team, your analytics, and so on — but overall, it’s a judgment call. You could have five different people do the same exercise, and they could come up with five different models. But that’s okay as long as your scoring is based on the data we mentioned previously. 3. Calculate the individual close rates of each of those attributes. Calculating the close rates of each type of action a person takes on your website — or the type of person taking that action — is important because it dictates the actions you’ll take in response. So, figure out how many people become qualified leads (and ultimately, customers) based on the actions they take or who they are in relation to your core customer. You’ll use these close rates to actually “score” them in the step below. 4. Compare the close rates of each attribute with your overall close rate, and assign point values accordingly. Look for the attributes with close rates that are significantly higher than your overall close rate. Then, choose which attributes you’ll assign points to, and if so, how many points. Base the point values of each attribute on the magnitude of their individual close rates. The actual point values will be a little arbitrary, but try to be as consistent as possible. For example, if your overall close rate is 1% and your “requested demo” close rate is 20%, then the close rate of the “requested demo” attribute is 20X your overall close rate — so you could, for example, award 20 points to leads with those attributes. The simple method, above, for calculating a lead score is a great start. However, the most mathematically sound method is one that employs a data mining technique, such as logistic regression. Data mining techniques are more complex, and often more intuitive to your actual close rates as a result. Logistic regression involves building a formula in Excel that’ll spit out the probability that a lead will close into a customer. It’s more accurate than the technique we’ve outlined above since it’s a holistic approach that takes into account how all of the customer attributes — like industry, company size, and whether or not someone requested a trial — interact with one another. If you’d like to explore logistic regression in Excel, check out this resource. In the meantime, the manual approach above this section is a great way to get started. Creating a lead score can do great things for your business: improve the lead-handoff process, increase lead conversion rate, improve rep productivity, and more. But, as you can see from the two methods above, coming up with a scoring system can be a time-consuming task when done manually. Plus, coming up with scoring criteria isn’t “set it and forget it.” As you get feedback from your team and stress-test your scores, you’ll need to tweak your lead-scoring system on a regular basis to ensure it remains accurate. Wouldn’t it be easier if technology could take the manual setup and continuous tweaking out, leaving your team more time to build relationships with your customers? That’s where predictive scoring comes in. Predictive scoring uses machine learning to parse through thousands of data points in order to identify your best leads, so you don’t have to. Predictive scoring looks at what information your customers have in common, as well as what information the leads that didn’t close have in common, and comes up with a formula that sorts your contacts by importance based on their potential to become customers. This allows you and your sales team to prioritize leads so you’re not harassing those who aren’t (yet) interested and engaging those who are. The best part about predictive scoring? As with any application of machine learning, your predictive score gets smarter over time, so your lead follow-up strategy will optimize itself. Want to find out more about predictive scoring? Learn about this automated process here.